Let’s get something clear up front. The point of this short post is not to minimize the grandeur of Rocky Mountain National Park, but rather to place our visit there into the context of our trip home from Yellowstone and the Grand Tetons. Indeed, RMNP has a special place in my heart; I’ve visited the park half a dozen times in the past 15 years. But by this point in our trip, we were both road weary and ready to get home, so this doubtlessly biased us against further adventures. Nonetheless, we had plenty of time to kill before we needed to be in Denver, meaning we could putter around the park at our leisure, which was a welcome change from the breathless pace of the prior 5 days. Unfortunately, our ascent up Trail Ridge Road, whose pinnacle offers a magnificent panoramic view of the alpine tundra and its attendant Rocky peaks near the Alpine Visitor Center, was cut short early at Many Parks Curve because of snow. Speaking of weather, that morning was cold and overcast, with low, dense clouds racing across the sky and threatening more snow. After waiting a half hour for the park to re-open access up Trail Ridge Road, we decided to turn around and re-explore the road-accessible eastern area of the park, including the alluvial fan, Moraine Park, Glacier Basin, Sprague Lake, and Bear Lake. This was familiar territory to both of us, since we had seen most of it on our second vacation together in the fall of 2004. By the time we arrived at tiny Bear Lake, the temperature had dropped about ten degrees, and thick clouds veiling the surrounding peaks had begun shrouding them in more snow. 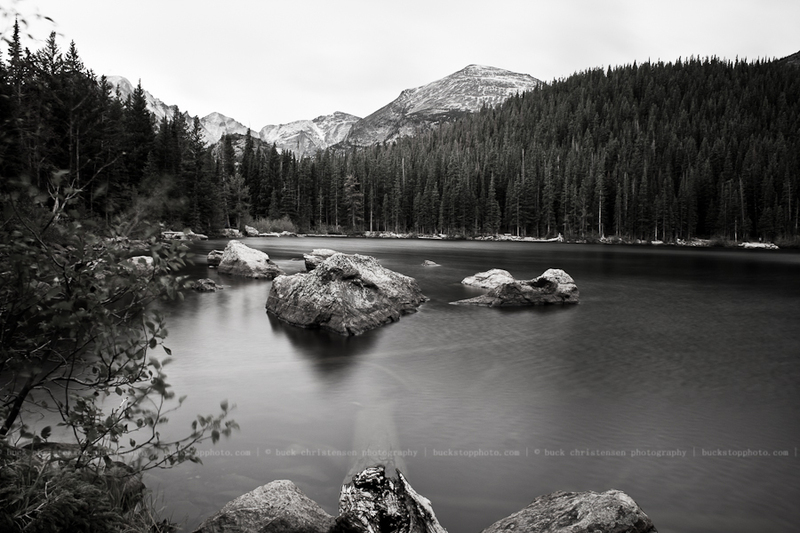 Aside from a roadside picnic area where Mill Creek and Glacier Creek converge (a shot of this is among the masthead images above), Bear Lake was the only place I spent much time with my camera that day. All in all, our visit to RMNP was relatively lackluster, not only because of our road weariness, but also because the novelty of Yellowstone had not (and still has not) worn off. It was a quiet end to a humbling, electrifying experience—one I hope to relive as soon as possible. By the way, I just want to thank those of you who have patiently taken this retrospective journey with me. Your encouraging feedback has been amazing.